The fear of violence has driven people to create different ways of protecting themselves from the evils of the world. As time passes, society seems to be more and more terrorized by this fear and people live in a constant state of heightened awareness. Gated communities are one of the ways in which people try to secure their safety. This essay is an introduction to the gated community phenomena that is taking place in Brazil. It is well known that Brazil is a country with a high rate of crime; hence, this palatable fear has taking grip of the people, making them overtly conscience of their safety. Gated communities in Brazil is a topic that interests not only the rich who can afford a safer place to live but across class strata’s and areas in society such as the vulnerable poor, middle and working class families and even the Government, the police, the media, the architects, the anthropologist or anyone who is looking secure some form of safety for themselves and their families. I will talk about the emergence of these communities in Brazil, how they function, the violence that leads people to create a ‘sub’community within an urban setting and its negative effects. Along with the research from the scholars who have written about the topic I have also interviewed 7 Brazilian people. For privacy reasons I will not use their real name in this text, instead I will refer to them as Diego, Thiago, Bianca, Paolo, Gustavo, Mateus and Eduardo. I will introduce their opinions about topics such as violence and gated communities in Brazil where I think it’s appropriate and relevant. The interviews took place on the internet, through email; I sent them the questions and then they responded. Of those people I have interviewed some are friends and others I’ve contacted through mutual acquaintances. They all agreed to the use of their answers in this essay. Gated communities in Brazil referred to as ‘condominios fechados’, are being expanded more than ever. The process of urbanization in Brazil, known for its speed, intensity, profundity and quick industrialization led to an imminent modification of the space i.e. the land area. (Arante 2009:2) Caldeira (1996), who completed valuable research on the topic, shows us how the gated communities emerged in Brazil, particularly in Sao Paolo. According to her, almost a century ago Sao Paolo used to be a centralized city, and the only difference between the rich and the poor is that the former used to live in bigger and more luxurious houses while the second used to live in a small place, shared with many family members. However, the city still functioned on the principles that an urban congregation consists of, such as common use of public space. During the 1940s and the 1980s , Sao Paolo began the process of division; the middle and upper classes used to live in the centre of the city while the poor moved to the periphery. It’s only since the 1980s and 90s that the condominios fechados emerged as a result of the fear of the violence. In the last decades, the number of crimes grew considerably. In Salvador, the first condominios fechados horizontais appeared between the 1970s and the 1980s. According to Arantes (2009:8), these first gated communities were built for the working class, usually people who worked for the same company moved into these residential areas (owned by the companies, in most cases). The residents of that period of time said that they preferred living in these new gated communities to get away from the city rush, to live in a more relaxed environment and be closer to the nature. Also, most of them were families with small children. It was in the 1990s when the purpose of living in these condominios fechados was the need of a safer place. In Rio de Janeiro, as well as in the other large cities, the industrialization and the migration from the countryside to the city modified the geography of the city. The suburbs emerged in the 1920s-30s. The favelas were the first suburbs that were developed in Rio de Janeiro ( Hermam :4). Starting in 1970s, the demand of lodging for middle and upper classes grew quickly and so people turned to the private companies. In this way, the first condominios fechados appeared in Rio de Janeiro. As Levy (2010:97) observes, the space is altered and frontiers are being burnt as a consequence of the globalization of the urban. However, in the past decades, the incidents of moving into a condominio fechado were the consequence of a sense of insecurity. As Rio de Janeiro developed quickly, so did the criminality; it became unsafe to use the public spaces and people started to regain their safety and freedom by moving into these isolated communities. Living in a gated community forces the public men to reproduce in a private space. (Levy 2010:103) There is a feeling of false community given by these walled spaces. ‘Gates, instead of creating communities are attracting people who prefer privacy and retreat from society’ ( Low 1997: 68) The social segregation is one of the main issues of these gated communities. Living aside this topic for the moment, Caldeira (1996:59) observes how the common characteristics of the condominios fechados involve this concept of segregation. All of these condominios fechados have armed guards and security systems so that they decide admission or exclusion of non-residents; they are designed in a introvert fashion and not towards the roads, they are isolated by big gates or surrounded by empty spaces; and nonetheless, they are private properties for collective use. We also learn from Caldeira(1996) that the condominios fechados suggest a certain status. Residents are creating a social distance from the others and separate themselves both consciously and unconsciously from the rest of the inhabitants of the city. ‘Os condominios negam os principios de uma vida urbana democratica.’1 (Levy 2010:105) ‘Residential segregation created by prejudice and social economic disparities is reinforced by planning practices and policing, implemented by businessmen and banks’ (Low 2001:46). What is even more striking is that mainstream media are also encouraging this new life style. There are many commercials and advertising in Brazilian media who aim to attract people in the condominios fechados and they often use ‘security’ and ‘safety’ as tools to sell the product. Some examples of this are the following condominios that are advertised through the utopia of safety : Lago : tranquilidade e vida moderna (tranquility and modern life) ; Freguesia : para voce vicer Feliz da Vida (so that you live a happy life) ; Estancia Ville : voce pode, sua familia merece (you can, your family deserves it) ; Fasol da Ilha: sua vida tambem pode ser perfeita (your life aswell can be perfect) ; Casa Propria : um final feliz para essa novela (…) com mais seguranca e qualidade de vida (a happy end for that story…with more safety and a better quality of life) ; Alphaville : viver tranquilo ( to live tranquilly). People feel an immense pressure from this both real and manufactured fear and an anxiety for their own safety that they move into these isolated places. Media rumours and true life experiences all contribute to the creation of a culture of fear in these Brazilian cities. Even though not everybody agrees that gated communities are the safest option, they all agree that is one way of keeping safe. When asked to mark their fear of violence from 0 to 10 , the results came up like this: Bianca : 10 ; Thiago : 9 ; Diego : 7; Paolo : 3; Mateus : 7 . These are a clear indicator that fear exists among Brazilians at very high rates. But how much of this fear is real and how much is based on contrived ideas or views? Is Brazil’s case of violence based on rumour and media propaganda? Or is it simply the reality they live? According to the Human Rights Watch 2011 report ‘There are more than 40.000 intentional homicides in Brazil every year. In Rio de Janeiro hundreds of low-income communities are occupied and controlled by drung gangs, who routinely engasge in violent crime and extortion.’ Violence is a vivid culture among Brazilians. They hear about it, they see it and they experience it. Newspapers and TV are showing everyday cases of crimes and violence , but this doesn’t seem to be just media propaganda, it is the sad reality of Brazil’s life. There are outrageous cases of violence in Brazil. Sckolhammer (39) reminds us of how a few years ago, when the Policia Militar entered a favela in Rio de Janeiro, they found a strong violent resistance from the criminals of that area but among them there was also a 14 years old girl who ‘orgulhosamente’4 was pointing the weapon at the police. This case was shocking and it is not singular. In Brazil, violence takes over all citizens. For some, especially the ones from favelas it’s a way of living , and for others, it becomes an obsessive fear. Nobody is privileged not to be a target of violence, regardless the form it takes. In 2011, the judge Patricia Acioli was shot dead and Congressman Marcelo Freixo declared that he will leave Brazil for a period of time due to many death threats he is receiving. (HRW report). The 7 people I interviewed live in different cities : Rio de Janeiro, Slvador de Bahia, Campina , Barretos, Sorrocaba and Teresina. All of them have been witnesses or victims of violent acts or have been robbed. They shared their stories and one can conclude that violence has strong roots in Brazilian society. These testimonies, along with all the media and official reports show that the culture of fear in Brazil is widely spread. Therefore, the condominios fechados seem to be one of the best solutions people can find to escape from the terror, at least whilst they are at home. Pastana (2005: 183) name this gated communities as ‘aquitetura do medo’9. These arquitecturas do medo transform the cities in big walls. The terrorized population chooses to live in fortified housing, decorated with professional alarm systems, cameras, and security men who are armed. People are afraid to use the public spaces and avoid going out at night times. Pastana(2005:185) observes that people chose to do activities indoors even in the weekends. They would rather watch a movie, order a pizza, talk on the phone and spend time on the Internet or play videogames instead of having a social active life in the public sphere of the cities. But how safe are these condominios fechados ? In reportage of TV Aratu, we are told that according to the Secretaria de Segurança Pública there have been registered a number of 494 assaults in the gated communities in 2010 in Salvador de Bahia. Criminals seem to find ways to enter even these well secured residential areas. They enter the communities under false identities, claiming that they are workers, electricians and so on. Once they are in, they usually succeed in robbing the houses. Many crimes also occur around the gates of this residential areas, when people go home. The condominios fechados are in fact good targets for the thieves as they know that only wealthy people can afford to live in such areas. This is another reason for people to fail to feel secured even at homes. As a consequence, people update their security systems all the time, and if until recently the security man was not necessarily a professional guard, now people hire professional security men, armed and trained to deal with all kind of possible unwanted situations. In the programme Reporter Justiça there was a reportage called Normas de condominios , where people are told how to protect themselves better in the gated communities and we also find that there actually exists a faculty in Brazil that created a module that aims to teach people how to secure the gated communities and how become good managements of them. The condiminios fechados are a popular topic in Brazil’s media. Another issue with the security of these residential areas is that even if the gated communities can restrain criminals to break in, people are still exposed to possible assaults when they leave their homes. As much as they try to avoid public spaces, they have to go to work or school and cannot build a whole gated world for themselves. The gated communities do not have a social diversity. The residents are living in a homogenised social group, with same socio-economic profile and the same phobia: violence. Fernandez (2005:2) concludes that this segregation of citizens in a city leads to the destruction of the city. If people don’t participate actively in the social urban life, this can alter significantly the meaning of being a citizen. Pastana (2005:188) argues that : ‘seja como for, esses enclaves representam um espaço que contradiz direitamente os ideas de heterogenidade, acessibilidade e igualdade que ajutaram a organizar tanto o espaço público moderno quanto as modernas democracias.’10 The question of a social segregation if very important in Brazil’s context. On one hand, we had the favelas, filled with very poor people, criminals and drug dealers, and on the other side we have the condominios fechados , occupied by middle and upper class. The public spaces are being avoided more and more often and so the question of a division of the Brazilian cities in the future is imminent. It is probably a simplistic view, but big cities in Brazil have created salient extremes and these are important factors of the segregation of the society. 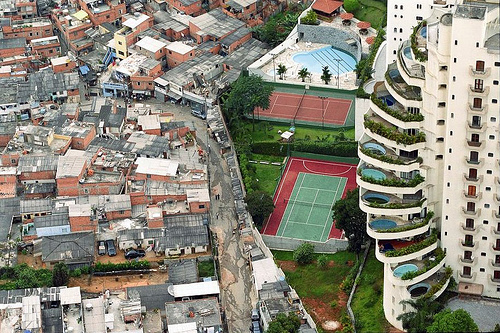 People often disagree with this Brazilian urban paradox, and blame the ones who contribute to it. But there is no doubt that citizens are victims of the violence and they can’t seem to find any other option than moving in walled areas. There is a famous song called Minha Alma , song of the Brazilian band ‘O Rappa’, that sings about the situation of the condominios fechados, blame them for contributing to the segregation, but also raises a very important question : how can one , in search of the protection and freedom, isolate himself in a prison ? The problem of segregation is not the only negative effect of the condominios fechados. Damaging the environment, creating discrimination, illegally occupation of public spaces in order to build new gated communities- hence violation of federal law , violation of human rights and the right of free movement and corruption are all negative consequences of the condominios fechados. In the documentary mentioned above, we find how people are being discriminated and forbidden to use the public beach. One of the victims, a fish men, tells how affected his life has been since the condominios from his area were built. Since he is a fishmen, he makes a living from fishing and so he is able to provide for him and his family. But the security guards of those condominios don’t allow him to pass through to get to the beach. The problem here is clear: the victims become victimizers and violate the law of free movement and human rights. Environment is another victim of the condominios fechados. An illustration of this would be another example given in the documentary ‘Prejudice and Greed:Gated Communities-Brazil’. In one of the condominios, the president of the neighbourhood association of housing subdivision interdicts the garbage truck to enter the area. Therefore, the solution they found was creating a new collecting point, outside the condominio. As a consequence, the pollution of the garbage accumulated there from 65 families, damages the surrounding area. All these violations are the result of the self-segregation that these condominios fechados produce. If at first the inhabitants of the condominios fechados were victims of the violent Brazilian society, one can observe how in some cases the roles are changing and they are the ones who generate social, economic and environmental issues. It is a vicious circle that only causes more alteration to the society of Brazil, and one can even argue that there is a civil war between the rich and the poor. I don’t know if it’s a solution for the personal safety but it is certainly a way of feeling safer when you come home at night, you have the sensation that your family are protected from any bad things. Vigilance became nowadays a way of feeling safe since there are CCTV , people watching all the time what is happening on their surroundings, which makes you liberate yourself from that worry of always being aware. No, because if the robbers want to they will find a way, just how they did it millions of times in Rio and Sao Paolo,(…) I think that the gated communities are safe , but apart from that they also provide services such as transport, gym, swimming pools. I have never been approached by anyone but I have been robbed a few times. One of my biggest fears is to be around an attack, I don’t know how I’d react or how the criminals would react. I have already been a victim of an attack. I was robbed. I was victim of 2 attacks in 4 months, one of them very violent with 3 attackers having a gun pointed to my head, while I was walking on the street on a Sunday at 19:30 , 200 meters away from my house which is in a nice district of Rio, Barr da Tjuca. The other attack happened when I ws in the car with my family and even though the attackers didn’t show their weapon they were acting as if they had one, and we were so terrified that we didn’t even want to see if he had one or not. (…) I am very upset because I live in such a beautiful city, so rich and with so many opportunities and I am not even able to walk on the streets without having a constant fear and only feeling safe in a closed place with security systems. I don’t even feel safe in buses or cars. You can call me paranoid but is the reality I live in. I can’t have a nice mobile phone because they’ll attack me and take , or I can’t have some nice sun glasses, I prefer not to have a car because I think it will draw the attention of the attackers, I can’t wear good clothes if I go to college because my college s situated in the centre of Rio, next to the Central do Brasil, a place where you don’t want to draw the attention to anybody. I am only 100% safe if I am at home and it really bothers me being so afraid. No matter how you put it, these gated communities represent a space that contradicts directly the ideas of heterogeneous-ness, accessibility and equality that help organizing both the public spaces and the modern democracies. The iron grating around the condominios serve to bring protection , but it also bring a question : is it not you who is in a prison? Illegalities are not only the privilege of the poor but also the rich are abusing of them. Higashi , Marcio Santiago 2011 Occupação Irregular e Criminalidade na Região da Serra da Cantareira . Revista do Laboratório deEstudos da Violência da UNESP/Marília, Edition 8 , pg 107-15. Schollhammer, Karl Erik 2007 “Breve mapeamento das relações entre violência e cultura no Brasil contemporâneo”. Estudos de Literatura Brasileira Contemporânea, nº. 29. pp. 27-53. • Por que morar em condomínio fechado?